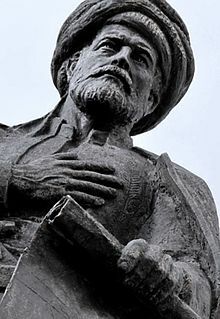 Ahmed Muhiddin Piri (1465/70 – 1553), better known as Piri Reis (Turkish: Pîrî Reis or Hacı Ahmet Muhittin Pîrî Bey), was an Ottoman admiral, navigator, geographer and cartographer. He is primarily known today for his maps and charts collected in his Kitab-ı Bahriye (Book of Navigation), a book that contains detailed information on navigation, as well as very accurate charts (for their time) describing the important ports and cities of the Mediterranean Sea. He gained fame as a cartographer when a small part of his first world map (prepared in 1513) was discovered in 1929 at the Topkapı Palace in Istanbul. His world map is the oldest known Turkish atlas showing the New World, and one of the oldest maps of America still in existence anywhere (the oldest known map of America that is still in existence is the map drawn by Juan de la Cosa in 1500). Piri Reis' map is centered on the Sahara at the latitude of the Tropic of Cancer. In 1528, Piri Reis drew a second world map, of which a small fragment (showing Greenland and North America from Labrador and Newfoundland in the north to Florida, Cuba, Hispaniola, Jamaica and parts of Central America in the south) still survives. According to his imprinting text, he had drawn his maps using about 20 foreign charts and mappae mundi (Arab, Spanish, Portuguese, Chinese, Indian and Greek) including one by Christopher Columbus. He was executed in 1553. For many years, little was known about the identity of Piri Reis. The name Piri Reis means Captain Piri (Reis is not part of his proper name). Today, based on the Ottoman archives, it is known that his full name was "Hacı Ahmed Muhiddin Piri" and that he was born either in Gelibolu (Gallipoli) on the European part of the Ottoman Empire (in present-day Turkish Thrace), or in Karaman (his father's birthplace) in central Anatolia, then the capital of the Beylik of Karaman (annexed by the Ottoman Empire in 1487). The exact date of his birth is unknown. His father's name was Hacı Mehmed Piri. The honorary and informal Islamic title Hadji (Turkish: Hacı) in Piri's and his father's names indicate that they both had completed the Hajj (Islamic pilgrimage) by going to Mecca during the dedicated annual period. Piri began engaging in government-supported privateering (a common practice in the Mediterranean Sea among both the Muslim and Christian states of the 15th and 16th centuries) when he was young, following his uncle Kemal Reis, a well-known corsair and seafarer of the time, who later became a famous admiral of the Ottoman Navy. During this period, together with his uncle, he took part in many naval wars of the Ottoman Empire against Spain, the Republic of Genoa and the Republic of Venice, including the First Battle of Lepanto (Battle of Zonchio) in 1499 and the Second Battle of Lepanto (Battle of Modon) in 1500. When his uncle Kemal Reis died in 1511 (his ship was wrecked by a storm in the Mediterranean Sea, while he was heading to Egypt), Piri returned to Gelibolu, where he started working on his studies about navigation. By 1516, he was again at sea as a ship captain in the Ottoman fleet. He took part in the 1516–17 Ottoman conquest of Egypt. In 1522 he participated in the Siege of Rhodes against the Knights of St. John, which ended with the island's surrender to the Ottomans on 25 December 1522 and the permanent departure of the Knights from Rhodes on 1 January 1523 (the Knights relocated briefly to Sicily and later permanently to Malta). In 1524 he captained the ship that took the Ottoman Grand Vizier Pargalı İbrahim Pasha to Egypt. In 1547, Piri had risen to the rank of Reis (admiral) as the Commander of the Ottoman Fleet in the Indian Ocean and Admiral of the Fleet in Egypt, headquartered in Suez. On 26 February 1548 he recaptured Aden from the Portuguese, followed in 1552 by the sack of Muscat, which Portugal had occupied since 1507, and the strategically important island of Kish. Turning further east, Piri Reis attempted to capture the island of Hormuz in the Strait of Hormuz, at the entrance of the Persian Gulf, unsuccessfully. When the Portuguese turned their attention to the Persian Gulf, Piri Reis occupied the Qatar peninsula to deprive the Portuguese of suitable bases on the Arabian coast. He then returned to Egypt, an old man approaching the age of 90. When he refused to support the Ottoman Vali (Governor) of Basra, Kubad Pasha, in another campaign against the Portuguese in the northern Persian Gulf, Piri Reis was beheaded in 1553. Several warships and submarines of the Turkish Navy have been named after Piri Reis. Piri Reis is the author of the Kitāb-ı Baḥrīye, or "Book of the Sea", one of the most famous cartographical works of the period. The work was first published in 1521, and it was revised in 1524-1525 with additional information and better-crafted charts in order to be presented as a gift to Suleiman I. The revised edition had a total of 434 pages containing 290 maps. Although he was not an explorer and never sailed to the Atlantic, he compiled over twenty maps of Arab, Spanish, Portuguese, Chinese, Indian and older Greek origins into a comprehensive representation of the known world of his era. This work included the recently explored shores of both the African and American continents; on his first World Map of 1513, he imprinted the description "these lands and islands are drawn from the map of Columbus." In his text, he also wrote that he used the "maps drawn in the time of Alexander the Great" as a source, but most likely he had mistakenly confused the 2nd-century Greek geographer Ptolemy with Alexander's general of the same name (of four and a half centuries before), since his map is similar with the Jan of Stobnica famous reproduction map of Ptolemy, printed in 1512. Ptolemy's Geographia had been translated in Turkish after a personal order of Mehmed II some decades before. It can be seen that the Atlantic part of the map originates with Columbus because of the errors it contains (such as Columbus’ belief that Cuba was a continental peninsula) since at the time the manuscript was produced, the Spaniards had already been in Mexico for two years. The Kitab-ı Bahriye has two main sections, with the first section dedicated to information about the types of storms; techniques of using a compass; portolan charts with detailed information on ports and coastlines; methods of finding direction using the stars; and characteristics of the major oceans and the lands around them. Special emphasis is given to the discoveries in the New World by Christopher Columbus and those of Vasco da Gama and the other Portuguese seamen on their way to India and the rest of Asia. The second section is entirely composed of portolan charts and cruise guides. Each topic contains the map of an island or coastline. In the first book (1521), this section has a total of 132 portolan charts, while the second book (1525) has a total of 210 portolan charts. The second section starts with the description of the Dardanelles Strait and continues with the islands and coastlines of the Aegean Sea, Ionian Sea, Adriatic Sea, Tyrrhenian Sea, Ligurian Sea, the French Riviera, the Balearic Islands, the coasts of Spain, the Strait of Gibraltar, the Canary Islands, the coasts of North Africa, Egypt and the River Nile, the Levant and the coastline of Anatolia. This section also includes descriptions and drawings of the famous monuments and buildings in every city, as well as biographic information about Piri Reis who also explains the reasons why he preferred to collect these charts in a book instead of drawing a single map, which would not be able to contain so much information and detail. A century after Piri's death and during the second half of the 17th century, a third version of his book was produced, which left the text of the second version unaffected while enriching the cartographical part of the manuscript. It included additional new large-scale maps, mostly copies of the Italian (from Battista Agnese and Jacopo Gastaldi) and Dutch (Abraham Ortelius) works of the previous century. These maps were much more accurate and depict the Black Sea, which was not included in the original. Copies of the Kitab-ı Bahriye are found in various libraries in Istanbul and in some of the major libraries in Europe, besides one copy known to be held privately in the USA (Walters Art Museum). Bologna University Library, ms. Marsili 3609. Bologna University Library, ms. Marsili 3612. Vienna, Austrian National Library, Cod. H.O. 192. Dresden, Staatbibliothek, ms. Eb 389. Paris, Bibliotheque nationale, suppl.turc 220. London, British Museum, ms. Oriental 4131. Baltimore, Walters Art Museum, W.658. Istanbul, Topkapı Palace, ms. Hazine 642. Istanbul, Köprülü Fazıl Ahmed Pasha Library, ms. 171. Istanbul, Süleymaniye Library, ms Aya Sofya 3161. Paris, Bibliotheque nationale, suppl. Turc 956. Piri Reis is mentioned in the video game Assassin's Creed: Brotherhood, and appears in its sequel Assassin's Creed: Revelations. In Brotherhood, a group of Italian Assassins sent from Rome to Constantinople by Ezio Auditore da Firenze infiltrates Piri Reis' shop to steal some of his maps detailing the New World, in order to match the Templars' expansion into the new lands. By Revelations, despite his earlier conflict with the Assassins, Piri joined the Ottoman Assassin Brotherhood in 1506 to serve as a scholar and technician, and even eventually progressed to the rank of Master Assassin. Later, he acts as a pyrotechnician, scholar and cartographer. Wikimedia Commons has media related to Piri Reis. ^ Arikan, Muzaffer; Toledo, Paulino. "VENEDİK'TEKİ PAPALIK SEFARETİ BELGELERİNE GÖRE TÜRKLER" (PDF). Ankara University (in Turkish). ^ a b Brotton 2003, p. 108. ^ Brotton 2003, p. 193. ^ a b Hapgood 1966, p. 246: "He was born at the town of Karaman, near Konya, Turkey. The exact date of his birth is unknown. In his early youth he joined his uncle Kemal Reis...Piri Reis whose, real name was Ahmet Muhiddin stayed with the Ottoman fleet during the reigns of Yavuz Selim and Suleiman the Magnificent..."
^ a b Khair 2006, p. 127: "Muhuddin Piri Reis was born at the naval base of Gelibolu (later known to "Westerners" as Gallipoli during the First World War) as a nephew of Kemal Reis, the most famous Turkish admiral and privateer or "corsair" of the period. He seems to have joined his uncle's ship at the age of 11 or 12..."
^ Carboni 2007, p. 311: "Piri Re'is, the nephew of a well-known Turkish mariner, learned seafaring and navigation from his uncle while both ... In 1511, Piri Re'is returned to his hometown of Gallipoli on the Dardanelles"
^ "Explore Istanbul: The Piri Reis Map". Archived from the original on 2011-07-10. Retrieved 2010-10-27. ^ Soucek 1996, p. 73. ^ Brotton 2003, p. 110. ^ Robinson 1998, p. 70. ^ Irzik & Güzeldere 2005, p. 286. ^ Ritman, Alex (14 November 2011). "Assassin's Creed: Revelations is historically impressive". The National. Retrieved 29 April 2018. Brotton, Jerry (2003). Trading Territories: Mapping the Early Modern World. London: Reaktion Books. ISBN 9781861890115. Carboni, Stefano (2007). Venice and the Islamic world, 828-1797. New York: Metropolitan Museum of Art. ISBN 9780300124309. Hapgood, Charles H. (1966). Maps of the ancient sea kings: evidence of advanced civilization in the ice age. Philadelphia: Chilton. OCLC 819363004. Irzik, Gürol; Güzeldere, Güven, eds. (2005). Turkish studies in the history and philosophy of science. Springer. ISBN 9781402033322. Khair, Tabish, ed. (2006). "Piri Reis: The Voyages of a 'Corsair' (c. 1526)". Other routes: 1500 years of African and Asian travel writing. Oxford: Signal. pp. 127–131. ISBN 9781904955122. OCLC 61177562. Loupis, Dimitris (2004). "Piri Reis' Book on Navigation (Kitab-i Bahriyye) as a Geography Handbook". Eastern Mediterranean cartographies. Athens, Greece: National Hellenic Research Foundation. p. 39. OCLC 892160459. Robinson, Francis (1998). The Cambridge illustrated history of the Islamic world. London: Cambridge University Press. Soucek, Svat (1992). "Islamic Charting in the Mediterranean" (PDF). In Harley, J. B.; Woodward, D. (eds.). Cartography in the Traditional Islamic and South Asian Societies. 2. Chicago: University of Chicago Press. pp. 263–272. Soucek, Svatopluk (1996) . Piri Reis and Turkish Mapmaking After Columbus: The Khalili Portolan Atlas. Studies in the Khalili Collection. 2. London: The Nour Foundation. Tekeli, Sevim (1986). The Map of America by Pîrî Reis. Ankara: Atatürk Kültür Merkezi Yayını. OCLC 41917181. Kahle, Paul, ed. (1926). Piri Re'îs. Bahrîje. Das türkische Segelhandbuch für das Mittelländische Meer vom Jahre 1521 (in German). Berlin. Kordoglu, Fevzi; Alpagot, Haydar; Pekol, Fehmi, eds. (1935). Piri Reis Kitabi Bahriye: eser ve yazean hakkinda bir onsozle bir endeks katilmistir [Piri Reis Kitabi Bahriye: with added foreword and index] (in Turkish). 2. Istanbul: Turk Tarihi Arastirma Korumu. Oktel, Ertugrul Zekai, ed. (1988). Piri Reis. Kitab-i bahriye. Istanbul: The Historical research foundation. Arī, Bülent, ed. (2002). Piri Reis. Kitab-i bahriye (in Turkish and English). Translated by Demir, Ahmet; Özden, Ercüment. Ankara: Republic of Turkey, Prime Ministry, Undersecretaryship of Navigation. ISBN 9755070966. OCLC 978146815. McIntosh, Gregory C. (2000). The Piri Reis Map of 1513. Athens, GA: University of Georgia Press. İnan, Afet (1954). The Oldest Map of America. pp. 28–34 – via sacred-texts.com. Reprinted as Life and works of Pirî Reis: the oldest map of America. Ankara. 1975. Kahle, Paul (1933). Die verschollene Kolumbuskarte von 1498 in einer türkischen Weltkarte von 1513 (in German). Berlin: Leipzig. Mesenburg, Peter (2001). "Kartometrische Untersuchung und Rekonstruktion der Weltkarte des Piri Re`is (1513)". Cartographica Helvetica (in German) (24): 3–7. Steven Dutch. "The Piri Reis map". Lunde, Paul (1992). "A Muslim History Of The New World". Saudi Aramco World. "Piri Reis: A Genius 16th-Century Ottoman Cartographer and Navigator". MuslimHeritage.com. "The Maps of Piri Reis". The Public Domain Review.